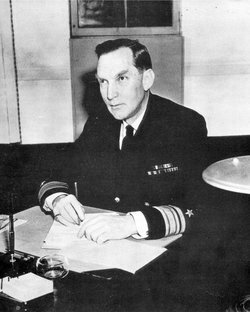 The Pacific War Online Encyclopedia: Beary, Donald B.
Beary was awarded the Navy Cross for convoy duty during the First World War. In command of transport Mount Vernon and Transport Division 19 when war broke out, he made a dangerous run into Singapore with British and Canadian reinforcements. Beary organized Service Squadron 6, an experiment in advance naval logistics. The squadron achieved remarkable success during the Iwo Jima campaign, delivering 2,787,000 barrels (about 370,000 tons) of fuel oil, 7,126,000 gallons (26,970,000 liters) of aviation gasoline, and 105,000 barrels (about 14,000 tons) of diesel oil to naval warships.